This is cool. 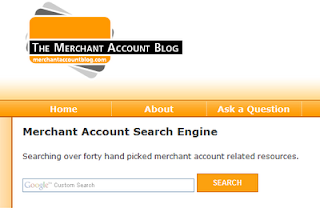 I just saw a nifty search function on a blog about merchant account services (They're promoting their own). It is a great informative blog. I haven't had a chance to test out this search engine but I'm going to. Oops, I just tried using it like a search engine putting in words like "security", "recurring billing", and "vendors" and either I'm not using it right or it's not working this morning. What a shame, it looks cool.